This facsimile edition of Albion W. Tourgée’s regimental history of the 105th Ohio Volunteer Infantry was first published in 1896. Tourgée, a lawyer and outspoken abolitionist from Williamsfield, Ohio, is best known for his semi-fictional novels about the reconstruction of the South following the Civil War, A Fool’s Errand and Bricks Without Straw. Both critically acclaimed best sellers, the novels catapulted Tourgée and his relentless efforts to secure equality for African Americans into the national spotlight. The Story of a Thousand also received a warm reception upon its publication, although it never achieved the level of recognition as his other works. 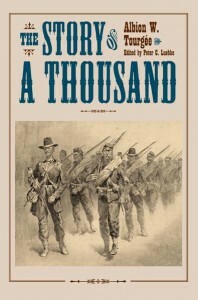 Written at the behest of his former comrades in the 105th Ohio, The Story of a Thousand draws on Tourgée’s own wartime papers, as well as diaries, letters, and recollections of other veterans, to detail the remarkable story of the regiment during its campaigns in Tennessee, Kentucky, Georgia, and Sherman’s March to the Sea. Tourgée concentrates on the lives and experiences of the enlisted soldiers, describing the backgrounds of the men and how they rallied around the Union flag as citizen soldiers and also on discussions about the role of slavery as the impetus of the war. Tourgée’s concern for the common soldier prefigures the scholarship of twentieth-century historians, such as Bell Irvin Wiley, who devoted attention to the men in the ranks rather than the generals and politicians in charge. Historian Peter Luebke revives Albion W. Tourgée’s lost testimony of the war in this new edition of The Story of a Thousand. He includes an index and a scholarly introduction that draws on extensive research to describe the writing, production, and reception of the book. Luebke also places the work in the context of recent Civil War scholarship. The inclusion of famed illustrator Frederic Remington’s engravings, which accompanied the book’s excerpts appearing in The Cosmopolitan magazine in 1894 and 1895, also enhances the text. Scholars, students, and enthusiasts of the Civil War and Ohio history are sure to enjoy this military account by one of Reconstruction’s harshest and most articulate critics. EditorPeter Luebke received a B.A. from the College of William & Mary and an M.A. in history from the University of Virginia. He studies the American Civil War, with a focus on Northern soldiers.